Here is a full list of contests and prize draws arranged for InstaForex clients trading both on demo and live trading accounts. The new season of InstaForex Great Race 2016 is running from March 7 until December 23, 2016. Hurry up to register for the contest. Enter the competition for the main cash prize of $6,000. The contest is held among demo accounts. Win BMW X6 from InstaForex! Welcome to take part in the new mega campaign, Win BMW X6 from InstaForex. It is held from December 28, 2015 until December 29, 2017. The winner will be awarded a high-powered luxury BMW Crossover 6 series. Deposit at least $1,500 to your trading account and register at the campaign webpage. Dream of a powerful and cutting-edge premium sports car? "Don't dream it, win it! Jaguar F-Type from InstaForex" is a new InstaForex campaign. Become its participant and maybe it is you to put a brand new Jaguar F-Type into your garage in autumn 2016! To jostle for the prize, you need to top up your account with $1,500 and register for the campaign. The raffle is held October 27, 2014 through October 31, 2016. Hurry up! The race to win Jaguar F-Type has already started! The Trade Wise, Win Device campaign raffles off such popular mobile devices as iPad, iPhone, Samsung Galaxy Tab, and Blackberry. Are you interested to win one of 12 gadgets? So, replenish your trading account with $500 and wait for the results. The raffle procedure is always transparent and fair as the owner of each device is determined at random. Are you a novice trader operating on a demo account with InstaForex? If yes, this contest is tailor-made especially for you. There are no restrictions on participation. The weekly prize pool is $1,500. The annual prize pool totals $75,000. The registration for the next step is available during the current step. Every holder of a demo account with InstaForex can enter the Lucky Trader contest. $3,000 is raffled off every fortnight. The annual prize pool is $75,000. You can sign up for the next step during the current contest. Do not hesitate to participate in the Real Scalping InstaForex contest held every month among InstaForex demo accounts. The monthly prize pool is $6,000. The total prize money equals $72,000. The contest starts at 00:00 terminal time first Monday every month and ends at 23:59:59 last Friday of a month. The unique online beauty contest is already in full swing! Charming ladies from around the globe have already entered the competition for the crown and great prize. Do not blow your chance! Welcome to register for Miss Insta Asia, the top-rated online beauty contest. The Beauty Queen title 2016 is still vacant. The contest is held annually. Its total prize pool is $45,000. InstaForex raffles off $1,000 weekly as the Chancy Deposit campaign. If you are keen to take part in the campaign, you need to deposit an amount over $3,000 to your trading account with InstaForex. The winner of $1,000 is determined at random every week by picking the individual number of a participant. Thus, keeping on your routine trading, you get a chance to replenish your trading account with $1,000 at the end of a contest week without any restrictions on withdrawal. Participation in One Million Option, the popular weekly contest, is available to any InstaForex client including those who operate on demo accounts. Option is the main trading instrument of this contest. So, hurry up to register! Every week, a lucky winner gets $1,500 to a trading or demo account. 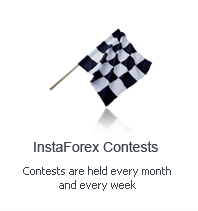 Any owner of a demo account with InstaForex is free to take part in this weekly contest without any restrictions. The weekly prize fund equals $1,500. The Heading to Anfield Again contest held by InstaForex and FC Liverpool has come to an end! The results of the first stage revealed ten participants with maximum scores on demo accounts. They took part in the final battle for the main prize. See the contest´s web page to find out the ultimate winner who will head to Liverpool. The campaign arranged by InstaForex jointly with Liverpool Football Club has come to an end. Three winners were determined on January 30, 2016. Their trading accounts´ numbers turned out to be the most similar to the Liverpool-number and met all criteria. Find out the names of the lucky traders on the campaign web page. The unprecedented prize draw of a superior Porsche Cayman is being held since April 22, 2013 until October 19, 2015. Absolutely any InstaForex client can take part in the campaign and win a gorgeous supercar. All you need is deposit no less than $1,500 to your trading account and register for the prize draw. Even if you are a newbie, you have the opportunity to test their strength and luck. The InstaForex Company is launching a new season of competition among demo-accounts "Great Race - 2015". The contest is held from month to month. The total prize fund is 55,000 USD. As before, the competition is held in four stages and after - a final. You can join the the contest right now! The Heading to Anfield contest jointly organized by InstaForex and Liverpool FC has come to an end. The binary options contest was held from November 3, 2014 to January 31, 2015. Visit the contest page to know the names of the lucky winners of VIP tickets to a home match of the legendary Liverpool FC. During 2 months between September, 15 and November, 15 InstaForex held the Christmas in Liverpool campaign. Three trips to the motherland of legendary The Beatles - Liverpool city, and VIP tickets with full hospitality to Liverpool FC home match were drawn. You can find out the names of three lucky winners on this page. At last, the campaign offering the posh Lotus Evora as the main prize has been over. The Lotus number was fixed on June 27, 2014 at 23:59. Sports Lotus is Your Trade Bonus lasted for two long years. So, the owner of the lucky trading account was Vybornov Aleksey from Moscow, Russia. You can visit the campaign webpage and find out what prize the winner chose. The final stage of the InstaForex Great Race 2013 campaign was brought to a close on December 27, 2013. The name of the prize winner will be disclosed soon. Please, be aware that the total prize pool equals $55,000. You can read the rules of the campaign on the main webpage. The prize draw of the Porsche Cayenne from Porsche AG, the world-renowned car manufacturer, was completed on September 27, 2013. As the result of the Best Trading, Luxury Driving campaign, Evgeniy Trots from Norilsk, Russia became the happy owner of the superior German car. On the campaign webpage, you can find out the lucky number pointing at our winner. Besides, you will learn about his choice money or luxurious crossover. The Fast Ride from the Best Broker campaign was officially closed on May 25, 2012. Over 3,000 traders from around the world took part in the prize draw. You may look up the name of the Fortune´s favorite visiting the main webpage of the campaign. The Win Lotus from InstaForex campaign came to an end in May 2011. This time, the main prize was the brand-new sports car Lotus Elise from the British manufacturer Lotus Cars. The gorgeous Lotus Elise went to the trader from Malaysia. We suggest that you should visit the campaign webpage to learn the rules of the prize draw and find the interview with the happy prize taker. The Hummer to a Jammy Fellow campaign was completed in May 2010. This time, InstaForex raffled off Hummer H3, a prestige off-road vehicle. On the campaign webpage, you can watch the video report of the festive award ceremony and read the interview with the lucky winner.